Subsurface storage of carbon dioxide (CO2) is one of the most promising technologies for removing large amounts of CO2 from the atmosphere. The method, referred to as CCS (carbon capture and storage), is regarded as an effective measure against global warming and climate change. A crucial part of the process is the injection of CO2 into porous rocks. In such an operation, complications may occur when pores become clogged so that the fluid flow decreases or stops. Salt precipitation is one of the main reasons behind changes in pore structure during CO2 injection and storage. Mohammad Nooraiepour, who is a research fellow at the Department of Geosciences, defended his doctoral dissertation on this subject in December 2018. He has studied the potential for efficient and safe storage of CO2in the North Sea and the Barents Sea. He has examined, among other things, what exactly happens when salt precipitates. Where in the pores are the crystals formed? And how is the storage properties of the rock affected? Nooraiepour's work is part of a larger project looking into the reactions between minerals, salt water, and CO2, lead by Helge Hellevang at UiO's Institute of Geosciences. One of the articles in his doctoral thesis was published in Environmental Science & Technology. It is written in collaboration with Hossein Fazeli, Rohaldin Miri and Helge Hellevang. Equinor has experienced that rock permeability is reduced over time when injecting CO2. The phenomenon has been studied by several UiO students since Helge Hellevang and Rohaldin Miri initiated the project a few years ago. Porous rocks can contain large amounts of saline water. In very porous rocks, more than 30 percent of the volume can be water. To put it simply, when injecting CO2, at a certain saturation point salt crystals begin to form – a process known as salt precipitation. "We discovered that the salt crystals form in the interface between the rock and CO2 and that they grow quickly while connecting to each other. Actually, there are several forms of salt crystals. The smallest is measured in micrometers. In our experiments we saw that they evolved so quickly that they could block the flow", explains Nooraiepour. "The salt crystals are hydrophilic, which means they love water, and they pull water over long distances. When water is pulled against the precipitation front, the salt content helps the salt crystals grow even larger. Therefore, when CO2 is injected, the permeability of the rock will be reduced or even blocked." What does this mean for full scale storage of CO2? "It means different things if you are close to the injection well or far away from it. For full-scale CO2 storage in the North Sea, salt precipitation near the well could make it more difficult to inject CO2. This fact was already known through experiments and field experiences. What was not known, were the mechanisms behind. My colleagues and I have contributed with more knowledge, and we have shown that salt crystals pull water over longer distances." This applies to the near well area during the injection phase. What about the caprock's ability to hold CO2, which is an equally important aspect to achieving secure storage? "For the storage phase, our findings on salt precipitation are good news. When you get further away from the well, salt precipitation can help make the storage more secure. The explanation lies in the fact that if there is a rupture, a crack, in the rock, and CO2 begins to leak, salt crystals will form in the openings. This has to do with changes in thermodynamic properties when pressure and temperature drop, resulting in reduced permeability and stopping the leakage over time. Salt precipitation will thus act as a self-repairing mechanism. This was not known before." Using advanced laboratory equipment (see facts), Nooraiepour and colleagues have tested and observed porous rocks under different pressures, temperatures and with different salinity. On this basis, they have done thermodynamic analyses of what factors may affect storage conditions. What is the significance of the findings? "When we talk about how CO2 is injected, we have gained new knowledge that can help reduce salt precipitation near the well. We understand more of the process, we know the thermodynamic factors affecting salt precipitation at different injection rates." Thus, researchers know which parameters need to be adjusted to prevent pores from being sealed during the critical injection phase. "For the storage phase, we have prepared a proposal for a new method for evaluating the injectivity and storage capacity of the reservoir. Again, it is essential to understand the thermodynamic mechanisms. That enables us to calculate how secure the storage reservoir will be over time." Conventional wisdom said that thermodynamic conditions did not affect how salt precipitates. 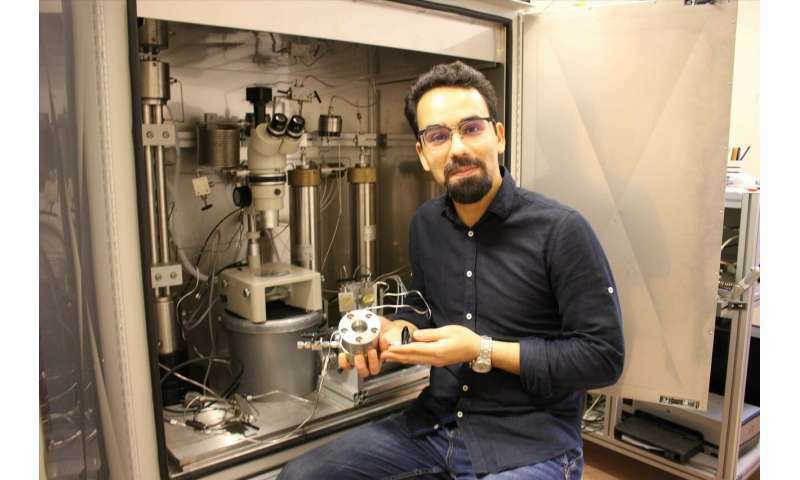 Nooraiepour has a different view on this – after experimenting with real rocks, varying high temperatures and varying high pressures while observing the process real-time in the microscope. He has seen how the salt crystals behave differently depending on pressure and temperature. "Essentially, it is about basic physics. It is a prerequisite for safe CO2 storage on a large scale." Until recently, Nooraiepour's research group has operated on a pore scale, using measurements of micrometers, which is 0.001 millimeters. In terms of field applications, the group will scale up the experiments and model the processes for core tests and field scale on larger, interconnected areas. How long will it take for the new knowledge to get practical significance for the storage of CO2? "Some of the physics we're introducing can be applied now. If this is to be used in conjunction with CCS, we now know that we must take the thermodynamic effects into account. We have two new doctoral students working to model these processes. At the same time, we plan to make field scale simulations. I hope that in two or three years time we can present the results of these experiments." Is the new knowledge of salt precipitation significant for other areas? "Yes, absolutely – for agriculture and environmental issues. Salt precipitation in soil reduces fertility, so there is a great potential."